Consult the misting systems experts in Dubai, Our Fogging system, Mist cooling, and Misting lines and fans are the best misting system for outdoor cooling available in the Dubai and UAE market. High-pressure Mist Drops are very small in microns’ sizes. The misting system can provide cooling getting wet which can happen with low-pressure mist systems. This mist is cooling for outdoor cooling solution available and can be customized to meet your requirements. Our wall mounted Misting fans are designed for outdoor use, and it can provide air flow along with the mist cooling. Those Misting fans systems come in deferent sizes from 6 inches and up to 38 inches. The misting system is also applicable for humidification applications. Also high-pressure misting systems and fog cannons widely used for dust suppression application in construction sites. Fog system misting lines and Mist fans can cool patios, Restaurants outdoor areas. It’s very easy way to cool outdoor spaces even in very hot summer. Mist systems using the water evaporative cooling principle for cooling. We provide design, supply and installation service for the outdoor cooling system. 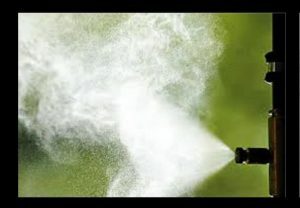 Water spray mist systems can also be used for humidification, dust suppression and odor control.